Discussion in 'General' started by Lish, Dec 29, 2005.
you can give it a go with a mild abrasive, might take a few goes, but doing anything by hand will take time. i would still be hesitant to go hard with paint 20 year old clear as there is a good chance it is the start of the clear failing. roof, bonnet and boot are the first panels to go as they cop the most of the eliments in general. 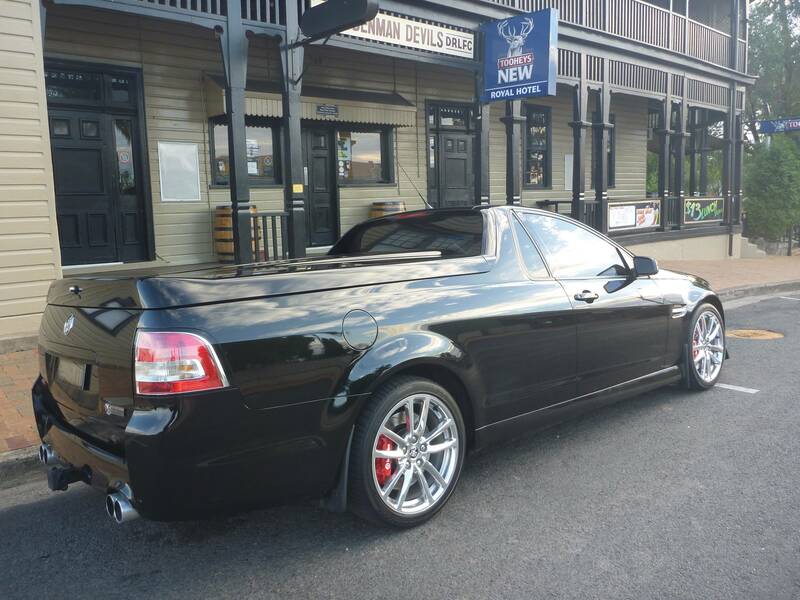 Hey guys, Im starting to have some concern with the way I wash my Ute, am I using the right products, should I be doing more? I can allready see some minor scratches, I generaly use some kind of generic car wash and and chamois followed by Turtle Black Detailer. My ute is about 6 months old. You need more to protect it. Black detailer is that, just a detailer. i used to use it until i did things right. A good wash like Armourall Wash n Wax, a good polish like Fireglaze, NuPolish, Chemical Brothers etc and or a good wax like Meguires Tech 2.0 of similar thats long lasting. A couple of things stand out as factors that could contribute to marring. One being the lack of waxing as mentioned above. Any detailing spray is not enough to protect a paint's finish - they are merely used to lubricate the surface for removing very light dust, mineral deposits from tap water after washing, fingerprints, etc - some will leave a very light sacrificial protective layer behind, but that's only really to extend the life span of your wax. I haven't used Turtle black detailer - nor would I. With a QD, you want the slickest spreading one you can find. If you MUST use something off the shelf, Meg's ultimate detailer is Ok but nothing special. Your choice of shampoo is also very important. You need something with high lubricity that can encapsulate the grime being removed from the paint and keep it away from the paint. Duragloss shampoo from CCP is ideal or Bowden's own from autobarn is very good also. A good shampoo doesn't have to cost the earth, just bought smart. Equally important is what you use to wash your car with - personally, I like the blue microfibre mitts from CCP - they do a good job of drawing contaminants up into the fibres, keeping them away from the paint, and rinse out easily. If you're not already doing it, the 2 bucket method is a must! Thanks Tinsnips, ill start doing that, and order some stuff from CCP. Whats next as far as waxing? If you make me a start to finish how to, with appropriate products, concider me your apprentice. Looks like the guys from CCP will handle every thing I nead to buy? BTW, we have unlimited water, we can wash on the concrete even, but it does leave a white mark allover, thats why I was using the black detailer. The other thing to consider, of course, is that at least some of the marring that is present would certainly have been present on the car when you picked it up. New cars are never perfect, so don't take all the blame. Use of a quality wax and/or sealant will help to protect the finish. Something like wolf's body wrap, which is a synthetic paint sealant, would be a good place to start. If you want the marks corrected out, have a chat to Blake from Envious Car Care - he's up in your neck of the woods and does sensational work. auto detailing the Hunter - he could even set you up with a correction and permanent ceramic coating package which will set your car up for the foreseeable future, assuming you follow a good wash technique. Alternatively, you could pick up a polisher pack from CCP and go from there. As for a how to, washing the car how it was demonstrated in the video is almost ideal - you may want to add a pre-soak with snow foam, or follow up with a spray wax but that's the nuts and bolts of it. The white marks you're seeing after washing the car will be mineral deposits from the tap water. I'm by no means saying don't follow a wash with a QD - I do all the time - all I'm saying is use a good one. Duragloss Fast Clean & Shine is good, Dodo red mist is expensive but good - or you could use a spray wax like Duragloss Aquawax or Zaino Z8 after your wash. But use any of those over an already waxed finish. You don't have to wax every wash (if you use a good wax/sealant) but it certainly doesn't hurt to use a QD after every wash.
Have a flick through these - How To // Car Care Products - most have videos attached and can be very helpful. Hi, I haven't had a chance to read through all the posts, but what would be the best interior detailing stuff (like to make the dash and everything looking new & shiny?) iv used the armour oil protectant spray stuff on my old car, but just curious to see what's best. Also what's the best way to clean the seats (the seats have some stains and marks on) a carpet and upholstery spay? Or something else? Ooo and whats good to clean the roof lining of a vy/vz this car has got some black marks if like to get rid of. It's also safe to use on entertainment screens and great for removing fingerprints from touch screens. Also, because it's a genuine no gloss product, you can even use it to clean and protect surfaces you wouldn't normally treat, like steering wheel, shifter and hand brake lever. How to deal with fabric staining will depend on what the stain is, but a good place to start is a deep clean with some All Purpose cleaner (Autoglym PM3 is good to work with Car Care Products / Autoglym / Exterior / All Purpose Cleaner / Multi Cleaner PM3 - $50 buys 5 litres of concentrate that you can dilute down however needed. Between 7:1 and 10:1 with water for interiors is generally enough, while 4:1 or higher may be needed for wheel arches, engine bays, tyres, etc). You can then follow this with an interior shampoo that will remove any residual APC and leave the fabric feeling and smelling clean and fresh ( Car Care Products / Autoglym / Interior / Carpet & Upholstery / Interior Shampoo ). For both products, mist them onto the fabric and aggitate with either a soft fabric brush or damp microfibre towel (the brush will work the cleaner deeper into the fabric for severe stains) and then wipe the excess cleaner away with a clean, damp microfibre. If you have a wet and dry vac, you can use this (wet setting obviously) to extract excess water and cleaner from the fabric. This will make drying faster. Leave your windows down for a while to let the interior dry out properly. You are better off hitting the fabric lightly a few times rather than saturating it. You don't want to get headlinings too wet as you can soften the adhesive that holds them up. I would start with spraying a little of the fabric shampoo on a clean microfibre towel and trying to spot out the stains. If that leaves clean patches on an overall grimy headlining, you may need to then go over the whole thing, but very light on with the cleaner. I've learnt a lot from this one topic, thanks! Has anyone heard of washing you panels (not the glass) with warm water and kero? Haha ok thanks, I wasn't going to do it regardless of the feedback I got. Just curious as to who's done it. Somehow it's popular with the over 80year-olds and it still trickles through from time to time. It will remove tar eventually - as well as any wax, sealant or trim dressing you may have on your car and leave behind a slightly glossy, solventy layer that will do nothing but dry out your rubbers. If tar is that much of an issue and you really have a deep seeded craving to use kerosene, use it neat on the affected areas, wash your car again, and re-apply whatever wax or sealant you had on there because it will have been stripped (same for any bug/tar remover) - but there are far more effective ways to remove tar. Awsome! Thanks mate! It's a god send having knowledgable honest people I can turn to for guidance. Only way to fix is through abrasive compounding. Sounds like it's a pre 09-ish model without clear coat to have oxidised as described. I've done a bunch of signage removal jobs and they can range fairly straight forward to irreparable. What it will largely depend on is how severe the oxidation is. It's not difficult to remove oxidation and make the whole bonnet shiny again, the issues arise when the oxidation has affected a significant thickness of paint, meaning you will forever have the outline of the signage, regardless of how much you polish. You CAN reduce that outline by wet sanding the affected area, depending on paint thickness and the like (not an ideal process for thin factory paint), however this will still leave a variance in texture (orange peel removal, essentially), which can be visible, meaning you'd need to do the whole bonnet, which is risky if you aren't confident with what you're doing. It is possible to sand defects without removing peel, however this method will also leave the texture of the outline from the vinyl graphics. Short answer... If you care how it looks, either organise for someone to do a test spot, or do one yourself and get an idea of how it will turn out through abrasive polishing. If you're not happy with the results, repaint the bonnet. If you don't care, remove the oxidation so the whole bonnet is shiny and live with the potential outline. This is all worst case scenario, like I said, sometimes it can be pretty straight forward and there is no noticeable outline left behind. New here and just picked up a 2015 gts. The car is black and exterior definitely requires a detail. It looks like it's been washed with a nasty old sponge and have fine scratches everywhere. I'm looking at recommendations for detailers. So far I have contacted Morrie at Reflection Perfection who gets great reviews online. Has anyone dealt with him before? Should I contact any others. I do not want a mobile operator as I cannot cater for shelter. whats the best product n method for removing compound cutter polish and wax from plastic ? windscreen washer cover dull n old looking... is there a product for restoring a natural look or shine besides painting it ? Found 2 brilliant glass cleaning products recently. First one is the Kitten Lens Doctor for cleaning those hazy headlight len covers quick n easy this stuff and the second is the Kitten Glass Doctor and again easy to apply and works a treat. The inside of my windscreen was that bad I was considering having a new windscreen fitted as I'd tried lots of different products and nothing worked well enough for when driving into the sun but this stuff left the glass crystal clear and once again able to drive into the setting sun without difficultly and NO I don't have any shares in Kitten.